The Select Software Packs for Target dialog allows you to specify Software Packs for a project target. Software Components, which are delivered with Software Packs, can be selected with the Manage Run-Time Environment dialog. Enable Use latest version of all installed Software Packs to use the latest version of the Software Packs. Software Components are updated automatically. This default setting is useful while the project is under active development. latest: use the latest version of a Software Pack. Software Components are updated automatically whenever a newer version of a Software Pack is installed. Older versions of the same Software Pack are excluded. fixed: expand to show all installed versions of the Software Pack and specify one or more versions from that list. Software Components in the project target will be used from these versions. excluded: no Software Components from this Software Pack are used. Some Software Components from this Pack are used. Some Software Components from this Pack are used, but the Pack is not installed. 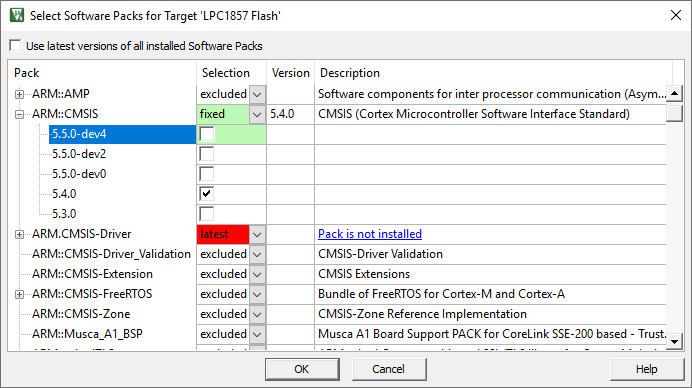 Some Software Components from this Pack are used, but the Pack is excluded. No Software Component from this Pack is used. This Software Component is not used in the current target. Depend on software components that are available only in specific versions of a Software Pack. Depend on the behavior of a specific version of a software component. Use software components that require a API which is only available in specific version of a Software Pack. If multiple versions of a Software Pack are selected, then the version of an individual Software Component can be specified in the Options for Component dialog. However, instead of specifying the Software Component, you can specify the Software Pack version that contains the Software Component. µVISION: Why is the EVR (Event Recorder) variant missing under STDOUT? MDK MIDDLEWARE: USB: After update, cannot find file "cmsis_compiler.h"
ARM: Where can I find the Keil::MDK-Middleware 6.5.0 pack?